Warthin-stary is a silver nitrate based stain used in histopathology for the visualization of spirochetes. It is also used for Helicobacter pylori, Microsporedia etc. This technique involves the argyrophilic reaction. The spirochetes are argyrophilic, which means they will absorb silver from a silver solution, but need a separate reducing agent in a solution to reduce the adsorbed silver to visible metallic silver. 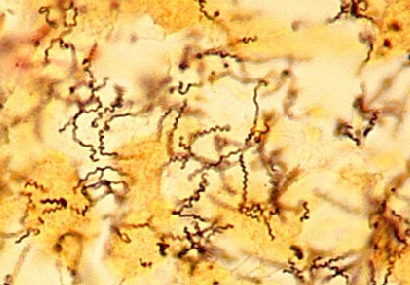 The stain demonstrates black spirochetes against a yellow to pale brown background. Deparaffinize and bring sections to distilled water. Place slides in 1% silver nitrate solution for 45 seconds in microwave. Let stand for 1 minute at room temperature. (Note: alternatively, in a laboratory microwave, heat at 80% power, 60ºC for 5 minutes, no standing time required). Prepare and preheat developer solution in water bath. Remove slides from silver solution. Do not rinse. Place slides horizontally on a slide rack and cover with developer. Allow sections to develop until they are light yellow to golden brown, approximately 1 minute or less. Wash quickly and thoroughly on hot tap water. what is the purpose of the staining? Is it to diagnosis of stomach ulcer?